A conference aimed at kick-starting peace talks between Israel and the Palestinians concluded on Sunday with more than 70 countries and international organizations pledging their support for a two-state solution as the only way to achieve lasting peace in the region. However, neither Israel nor the Palestinians was represented at the conference in Paris, raising questions about its ultimate value. Palestinian leader Mahmoud Abbas had welcomed the event, but Israeli Prime Minister Benjamin Netanyahu branded it futile. The final statement at the conference called on Israel to withdraw to its 1967 borders, as required by United Nations resolutions, and for both parties to “abstain from unilateral actions” that could jeopardize future negotiations. The lines referred to date to before the Six Day War, when Israel captured the Gaza Strip from Egypt and the West Bank and East Jerusalem from Jordan, expanding its borders beyond those drawn up in the 1949 armistice between Israel and its Arab neighbours, lines that Israel rejects. “If we don’t do anything, we risk letting the situation descend into a conflict; a conflict written in advance,” Ayrault said. Hopes for a two-state solution, which envisions the countries of Israel and Palestine living side-by-side in peace, have faded as neither side has engaged in serious negotiations since 2014 and Israel has pushed ahead with settlement expansion into territory claimed by the Palestinians. Diplomats warn, however, that in a single state over the entire region in question, Israeli Jews would eventually be outnumbered by Palestinians, creating a violent, apartheid-style system. The two-state solution is threatened and there is a need to preserve it. … Now is not the moment to stop. U.S. Secretary of State John F. Kerry attended the meeting in what will almost certainly be his last diplomatic effort abroad. He had long hoped he could revive the stalled peace talks and coax the two sides closer to solving their intractable problems. But he was never able to engage either side, and in fact saw relations between Washington and its longtime ally, the Israeli government, deteriorate. A low point came last month when the U.S. declined to veto a United Nations resolution condemning Israel’s settlement expansion. Kerry said on Sunday the Paris conference “moved the ball forward,” adding he had spoken to Netanyahu to reassure him that Israel would be treated fairly. “It underscores this is not just one administration’s point of view, this is shared by the international community broadly,” he said. Ahead of the meeting, Kerry’s aides had acknowledged to reporters that expectations for any real progress were low. French President François Hollande also addressed the gathering, which included 36 foreign ministers, as well as Ahmed Aboul-Gheit, the secretary-general of the Arab League, and the European Union’s foreign affairs representative, Federica Mogherini. German foreign minister, Frank-Walter Steinmeier, as well as the Irish, Italian, Dutch, Polish, Portuguese, Turkish and Swedish foreign ministers were also present. “Our common aim, which is a noble aim, is that of a fair and lasting peace between the two countries. I am conscious of the reservations and doubts about this conference … but it is urgent to act,” Hollande said. The conference taking place in Paris today is an idle conference. It was coordinated between the French and the Palestinians. Its purpose is to enforce on Israel conditions that are not in line with our national needs. Of course it creates a bigger gap regarding peace because it hardens the Palestinians’ stance as well as putting us further away from direct negotiations without any preconditions. Netanyahu also appeared to be hailing the imminent arrival of Donald Trump’s administration, which takes office on Friday. “I must say this conference is one of the last gasps for breath from yesterday’s world. Tomorrow will look different and tomorrow is very near,” the prime minister said. Trump’s choice as the next U.S. ambassador to Israel is David Friedman, who has said he opposes the two-state solution and has supported settlement expansion. There was no mention at the Paris conference of Trump’s stated intention to move the U.S. Embassy from Tel Aviv to Jerusalem, a city both sides want as their capital. Kerry said its inclusion would not be appropriate, because the issue is still under debate in the U.S.
On the occasion of the conference being held in Paris today (Sunday, 15 January 2017), B’Tselem reiterates its position that the international community must act to protect human rights and bring about an end to the occupation, which is a fundamental violation of human rights. In this context, B’Tselem welcomes the broadest international adherence to Article 5 of recent Security Council Resolution 2334 to distinguish between Palestinian territory occupied since 1967 and the internationally recognized borders of the State of Israel. While B’Tselem does not take a position on any specific political outcome for ending the occupation, we welcome a human rights based future, one that will guarantee justice and liberty for all people living between the Jordan River and the Mediterranean Sea. There are different paths to realize this future, but the continuation of occupation is not one of them. Israelis and Palestinians will one day end the occupation – but this will not happen without decisive international action. 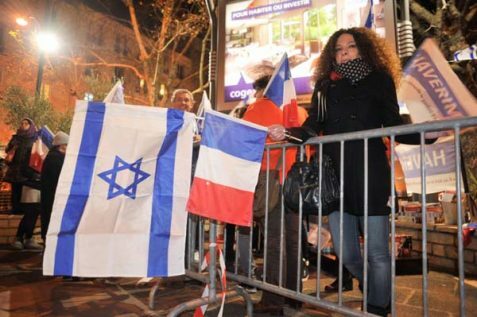 The joint declaration of nations gathered in Paris to reaffirm their support for UN Security Council resolution 2334 (2016) which condemned Israel’s presence in her own capital, and the presence of half a million Jews in their homes. After intense discussions, the delegations of 72 nations voted unanimously to accept the declaration, with one exception. The United Kingdom did not sign the document, having expressed reservations and in any case, having attended as an “observer” only. They welcomed international efforts to advance Middle East peace, including the adoption of United Nations Security Council resolution 2334 on 23 December 2016 which clearly condemned settlement activity, incitement and all acts of violence and terror, and called on both sides to take steps to advance the two-state solution on the ground ; the recommendations of the Quartet on 1 July 2016 ; and the United States Secretary of State’s principles on the two-state solution on 28 December 2016. They noted the importance of addressing the dire humanitarian and security situation in the Gaza Strip and called for swift steps to improve the situation. They emphasized the importance for Israelis and Palestinians to comply with international law, including international humanitarian law and human rights law. – welcome the prospect of closer co-operation between the Quartet and Arab League members and other relevant actors to further the objectives of this Declaration.